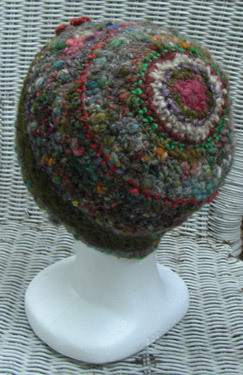 This is an extra long cloche style round cap that is made from a blend of wool and silk with a bit of malamute hair added into the section nearest the top circle. The thin bright red, green and lavender accent stripes are soy silk, and the greenish brown band with the flower is tussah silk. 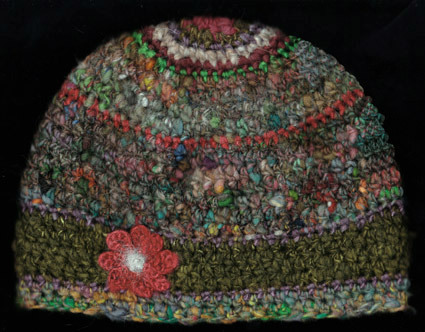 The flower is soy silk with a soft, fuzzy malamute hair center. 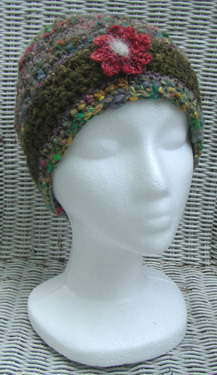 The light stripe around the top is a blend of llama wool and malamute hair.